The Prior Lake Amatuer Baseball Association sponsored a team in the Minnesota Senior Mens Amatuer Baseball Association for the 2005 Season. The team, made of of area residents primarily from the Prior Lake, Savage and Burnsville areas played a partial regular season to qualify for the annual 2 weekend State Tournament which concludes this weekend at host parks: Union Hill, Jordan and Belle Plaine. The team adopted the name “Mudbirds” to reflect its heritage and sponsorship by the PL Jays & Mudcats MBA baseball teams of the PLABA. The Mudbirds dropped game one of the tourney to the Morris Legends by a score of 6-4 at Union Hill on Saturday 7/20. PL starting pitcher Don Zeyen yielded 5 runs in the Morris 2nd on 3 hits a walk and a sacrifice as well as a PL error. Jack Haugen pitched 3 innings of scoreless relief. &apos;Bird shortstop Mike Lohrmann led hitters going 3 for 4 with a double and scored on catcher Kevin McDonalds single in the 4th inning. John Amodeo was 2 for 3 with a run scored while Kevin Haferman tallied 2 runs batted in (Mark Karos running for Ted Ashton & Mark Zweber scored) the 5th going 1 for 2 on the day. The Mudbirds had 10 hits on the day. PL&apos;s defense did make its mark in MSMABA history be recording the first triple play in League history in the 7th inning with two on by a walk and single followed by a ball hit to 3B John Amodeo who relayed to 2B Haferman who relayed to 1B Mark Zweber to complete the rare and historic triple play. The league had played with 1 out in all seasons prior dating back to 1982 but with the switch to woodbats, this was the first season of “3 out ball”. The Mudbirds scored one and threatened in the 7th but the score would end as a 6-4 Morris victory. Sunday 7/21 the PL nine took on the Montgomery Loons in Jordan dropping a 10-3 decision with a big Loon inning on PL starter John Anderson yielding 2 runs in the first and 5 runs in the 2nd inning on 3 walks, 3 hits and 1 PL error. The &apos;Birds, down 7-0 in the 4th, answered with 3 runs on hits by Lohrmann, Amadeo and Zeyen who scored and hits by Jay Jendersee along with an Ashton walk and John Kipkowski hit by pitch which drove in Zeyen to make the score 7-3. Jendersee was 2 for 2 with 2 walks on the day to lead PL hitters. The PL Mudbirds had runners aboard in the 5th, 6th and 7th but stranded 8 of the 11 runners in the game in the final 3 innings. Montgomery posted 1 in the 6th and 2 in the 7th to make the final 10-3 score to put PL at 0-2 in the Tournament. The Prior Lake Mudbirds effort was directed by PLABA Vice President Tex Chapman. “Over 35 baseball is growing and it seemed like a good fit to bring our leadership to provide the opportunity to this group of players as well as grow our organization to provide more of a positive impact to the local baseball scene and community” repled Chapman when asked about PLABA&apos;s role in starting the team, “If we have more interest, we can continue to grow the program to include an additional team in &apos;06”. Jerry Maas, MSMABA Director, PL Mudbird Assistant Coach and Co-Founder commented, “PLABA certainly sets an example for other communities in tying together youth baseball, town ball and senior ball for a lifetime of playing our national pastime”. The MSMABA State Tournament concludes 8/27-28. The Prior Lake Mudbirds return to action Saturday 8/27 1200PM In Belle Plaine and either 1000AM or 1230PM in Jordan on Sunday 7/28 to conclude the Tournament. 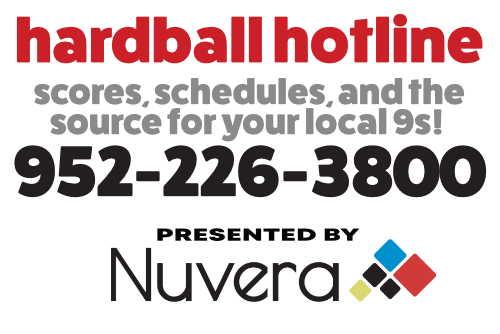 The Integra PL Hardball Hotline will have the gametime for Sunday at 952-226-3800 and additional information on Over 35 baseball is available at www.priorlakebaseball.com or the MSMABA Offical Website at www.msmaba.com.